Working with Stanford University’s Clinical Excellence Research Center (CERC), the Peterson team looked at 15,000 single and multi-specialty physician practices around the country and winnowed the list to those practices which were in the top 25% on quality measures and in the lowest 25% in cost. The second step was to identify the features of practices that help explain their exceptional performance. 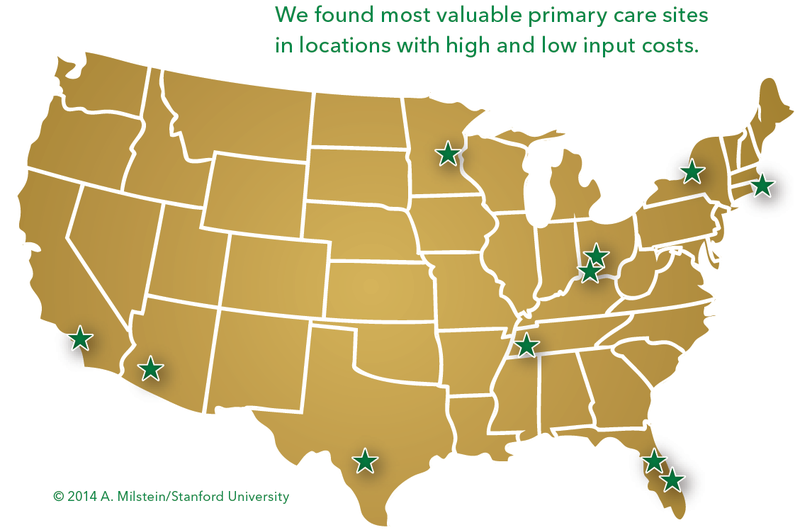 This led to the identification of the 11 most exceptional physician practices (see above map) around the country. The study found that total annual health spending was 58% lower for patients cared for by these exceptional practices compared to their national peers. Further analysis finds that nationwide adoption of the observed features of these practices would conservatively save $300 billion per year. Their patient relationships are deeper: always on, conscientious observation, and complaints are gold. They have wider interaction with the healthcare system: responsible in-sourcing, staying close, and closing the loop. They have a team-based practice organization: upshifted staff roles, hived (highly collaborative) workstations, balanced compensation, and investment in people rather than space and equipment. The Peterson Center on Healthcare is in the process of showing that free enterprise health care can achieve remarkable gains in both high quality and low cost. This is hugely important at a time when total U.S. spending on healthcare is already way too high and growing rapidly. If private enterprise and the free market cannot figure out how to provide quality healthcare at a much lower cost, it is almost inevitable that the U.S. will eventually end up with a single-payer national healthcare system like most of the rest of the world. This entry was posted in health care, health care spending, Jack Heidel, Peter G Peterson, Peterson Center on Healthcare, Peterson Foundation and tagged health care, health care inflation, jack heidel, low cost healthcare, quality healthcare by jackheidel. Bookmark the permalink.